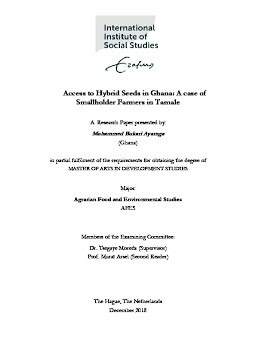 Through the case of two communities in the Tamale Metropolis, this study was set out to examine smallholder farmers, access to hybrid seeds in Ghana. The focus of which was centred on why and how small holder farmers’ access hybrid seeds in Ghana. Evidence from data gathered from the field suggest that: non-availability of hybrid seeds, cost implications and gender power relations are some of the bottlenecks that militate against access. The study further articulates factors that drives smallholder farmers’ adoption of hybrid seeds and how it affects seed diversity in Ghana, and subsequently unravels the environmental externalities and how that relationship impacts smallholder farmers. Interestingly, the study also showed an economic angle to the discourse, it highlighted the politics surrounding hybrid seeds in the countryside and unmasked the relationship between hybrid seeds and indebtedness among smallholder farmers. These challenges that hybrid seeds present, calls for the promotion of traditional knowledge system of seed saving and farming practices. This will protect and promotes local crop diversity in Ghana.